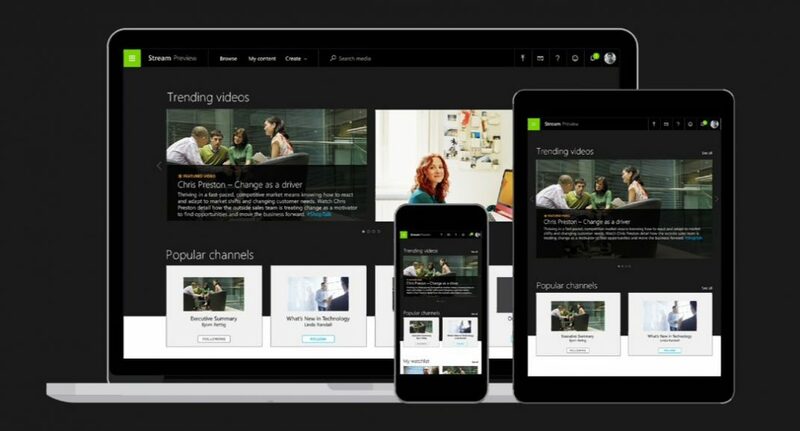 Microsoft launched a new video sharing site for businesses called Microsoft Stream. Microsoft new site will replace Office 365 Video for business. Office 365 Video will continue to work during the Stream preview period. Today we are announcing the free preview of Microsoft Stream, a new business video service that democratizes access to and discovery of video at work. Starting today, anyone with a business email address can sign up for the preview in seconds and begin uploading, sharing and tagging videos in their organization. By taking the “work” out of managing video storage and security, Microsoft Stream enables organizations and their employees to communicate and collaborate with video more easily. Sign up in seconds: Get started with Microsoft Stream in as few as five seconds with easy signup and no credit card requirements. Easily upload and organize your video: With easy drag and drop capabilities, upload your videos and organize them by either starting a channel or contributing to a channel based on team, group, topic etc. Discover relevant content: Enhanced content discovery through “trending” videos powered by machine learning, as well as search by hashtag, most liked videos and other key search terms. Watch anywhere, on any device, anytime: View videos in Microsoft Stream on all your devices from anywhere, anytime. Secure video management: Manage who views your video content by determining how widely to share within your organization, and to what channels. Secure application access is enabled by Azure Active Directory, a recognized leader in identity management systems, to protect sensitive corporate content. Follow what matters: Follow channels to see content you want in your Microsoft Stream homepage. Engage with content: Socialize videos by sharing via email, “Like” your favorites and embed videos to webpages within your organization.